Combine all filling ingredients in a bowl, set aside. Slice each unbaked cinnamon bun in half. Dust slightly with flour and roll out to pie crust thinness. Line the bottom and sides of a pie plate with the flattened buns. Place filling in the unbaked pie shell, and top with remaining flattened cinnamon buns as a top crust, sealing the edges. Drizzle the glaze from the cinnamon bun canned biscuits, over the top. 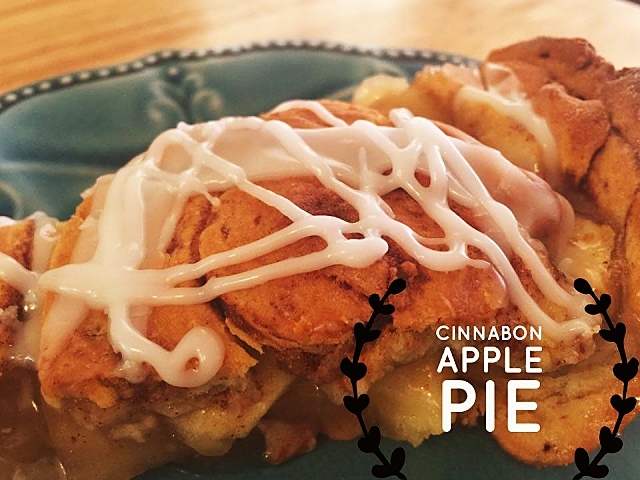 while the pie is still warm.